It's tremendously important to introduce kids to poetry early, so that it becomes a part of their lives the way stories are. But where do we find books of poetry that are suitable for kids? Enter Machino Supremo! poems about machines! It's a perfect choice. It builds on children's fascination with machines and inventions of all kinds. 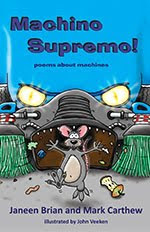 Written by Janeen Brian and Mark Carthew, and illustrated by John Veeken, Machino Supremo was published by Celapene Press (2009). a whizzer, a thumper or grinder? Poets Brian and Carthew enchant us with rollicking rhythms and humorous rhymes. They've written poems to make us giggle, and look at the machines in our lives with fresh eyes. With titles like 'Power to the egg beater', 'The dippledoppler toaster', and 'What not to put in the washing machine', we know we're in for some whooshing, clanking fun. And so we are! I have always suspected that escalators are steel-toothed alligators (and shiny sandal-haters), and now I know for sure. Veeken's black and white sketches are in comic style, and add to the humour. They support the text, but quirky details also add another dimension for young readers. I believe they would provide inspiration for young artists too. The colourful front cover is great, with a terrified rodent running away from an implacable street sweeping machine. Reluctant readers might be tempted by books that aren't long narratives - tempt them with Machino Supremo. Bite-sized poems are easy to read, and fun to learn. The font choice also supports the interesting, active vocabulary, with words like 'twirls and whirls', and 'snaky coil' imitating their real life movement on the page. Machino Supremo! poems about machines lends itself to being shared in a family read-aloud, or makes an ideal choice for schools. Books like this teach children to enjoy language. They celebrate a love for language in general, and poetry in particular. It has been selected for the 2010 Premier's Reading Challenges for South Australia and New South Wales. And the Book Chook pronounces it a rattling good read! What fun! I think this will book of poetry will really appeal to boys and reluctant or struggling readers!